While winter is still around the Treasure Coast and weekly cold fronts will continue to bring cool nights and lots of windy days to the area, fishing will still be good out on the water. It has been a tough winter so far with all the rain, winds and cold. Water temperatures can dictate where and how you might fish on any given day this month. January was a much warmer month this year. When the water is cold, fish the deeper cuts and drop offs of the river. Sunny days will bring fish up in shallower waters to feed and the bite can really get hot out on the flats. The trout bite picks up very nicely in February. 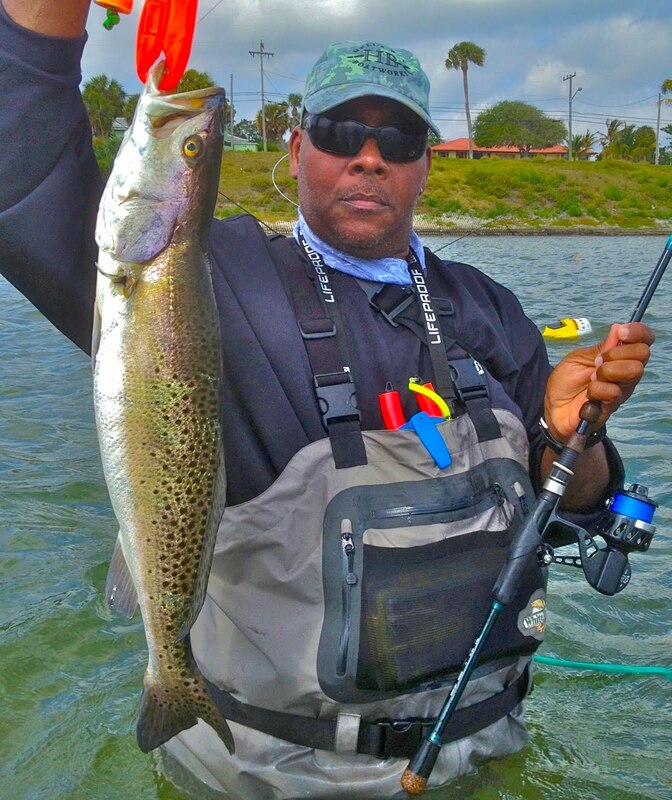 2017 proved to be the year of big trout in the Fort Pierce area. I anticipate that 2018 will be another big fish year around the area. CAL jerk baits and Deadly Combos are exciting ways to trout fish with artificial lures, while live shrimp on popping corks are the ol’ standard way to trout fish out on the river. Redfish can be found in shallow flats around mangroves and islands. We had a fantastic winter bite in 2017 around the docks and mangroves for redfish. On warm sunny days, the reds will sit around the mangroves and soak up the sun. Finding some along the mangroves will bring some good rod bending action to anglers this month. DOA shrimp and CAL jerk baits can find some hungry reds hugging the mangrove lines when fished very slowly. Docks are a great way to find plenty of fish waiting for something tasty to drift under them. Sheepshead will be plentiful around the river and the larger fish will be coming into the river to breed. They showed up early this year and January has been a great month for them. Live or dead shrimp around bridges, docks and structure can provide lots of action in addition to some great tasting fish. Sand perch and croakers should also be hanging around the inlet and bridges during February. Pompano around the surf and on the deeper flats of the river can be taken on CAL grub tails, Doc’s Goofy Jigs and shrimp or clams. Bluefish, mackerel and jacks will continue to haunt the baitfish around the jetties and turning basin. Small, shiny lures will keep you busy. There should be some flounder around the back sides of the jetties and on sand flats around the inlet area. February is a transition month on the river. Winter has been challenging this year on the Treasure Coast. We have enjoyed more normal winter weather and the fish bite has been good for us. Winds will still be blowing and the water will begin to gradually rise in temperature. Fishing your lures slowly will certainly give you more action on the river. Fish tend to be sluggish in the colder water. Working your lures or bait slower along the bottom will give the fish more time to react to it and will result in more bites for anglers. F*&KING AGGRESSIVE Fish CRUSH Our LURES!!! When is Procure most effective?